North Carolina A&T’s journey started back on a moderately-cool August day in camp. The big question on everyone’s mind was whether or not the Aggies could continue to play on a high level without their All-Everything Back, Tarik Cohen. Three-and-a-half months, 12 victories and zero losses later, the answer is a resounding: YES. 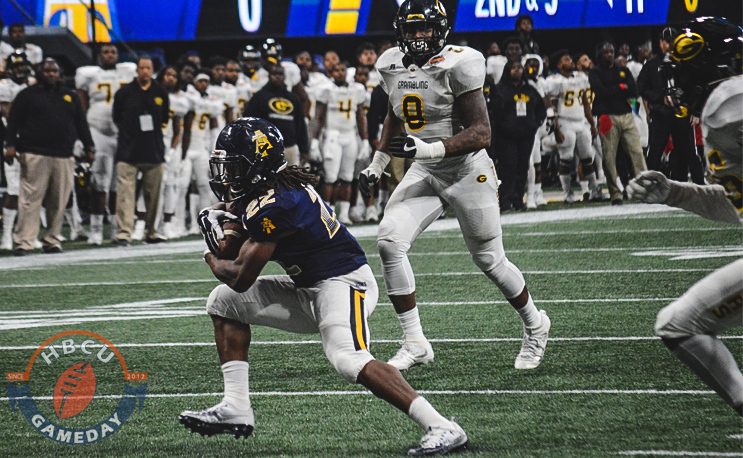 From start-to-finish this season, A&T established itself as a force to be reckoned with in the MEAC and beyond with three players on the offensive side stepping up from the shadow of their legendary teammate and etching their names into Aggie Lore. All eyes were on Marquell Cartwright on that day as he was tasked with replacing Cohen as A&T’s starting running back. A physical runner with deceptive speed, Cartwright burst on to the scene as a freshman in 2014, spelling Cohen as he fought off injuries that season. After missing 2015, he came back to the fold in 2016 to serve as his understudy again. This season, though, Cartwright showed that he was more than capable of holding his own. The conference’s leading rusher, he churned his feet to the tune of 1,190 yards and 14 touchdowns in 2017. And fittingly it was Cartwright who put the team on his back on Saturday, scoring two touchdowns while rushing for 110 yards. He also caught three passes for 54 yards, including an 11 yard score after catching just two passes all season. Perhaps his biggest play was a catch he didn’t make, as his drop late in the game kept Grambling from getting the ball back with the game tied in the fourth quarter. “I never caught it,” Cartwright said in the postgame press conference. When asked if he was sticking to that story, he replied, he grinned and affirmed. Elijah Bell entered the season as a player on the rise, coming off a first season that saw him named MEAC Rookie of The Year in 2016. He started off the season on fire, catching seven touchdown passes in his first four games, including a spectacular four-catch, 95 yard performance in which he went for two touchdowns. The West Virginia native was a headache for defenses all over the field, averaging nearly 16 yards per catch during the regular season while scoring 11 touchdowns on 54 receptions. During the Celebration Bowl, Bell chewed up the Grambling defense in small chunks, catching 10 balls for 95 yards, including a crucial grab to set up the game-winning score. Even before A&T suited up for its first practice of the 2017 season, expectations were already high for the rising junior from nearby High Point, NC. Head coach Rod Broadway beamed when talking about his quarterback at MEAC Media Day in Norfolk, VA.
“If he would have stayed on course last year…could have finished his season, the way he was playing at that stretch of the season, I think we could have been a little bit better of a football team than we showed at the end of the year,” Broadway said. Well luckily for A&T, Raynard managed to stay healthy the entire season, rebounding from a torn pec late in the 2016 season with a record-setting 2017 season. Raynard threw for 2,935 yards as a junior, shattering A&T’s single-season mark. He also threw for 29 touchdowns and just seven interceptions while running for four scores, including a one-yard plunge with 1:04 remaining against Grambling to seal the second HBCU national title in three years for A&T. And there you have it. The team that lost the most irreplaceable offense force in black college football in decades showed it already had everything it needed to reach even further heights in 2017. The biggest question heading into 2018: Can the Aggies do it again?